The Copperhead Snake (Agkistrodon contortrix) is shorter than both the Coral snake and the Cottonmouth snake. The Copperhead Snake is the most often encountered snake in Eastern parts of the United States such as Alabama, Missouri and Arkansas. Copperhead snakes are responsible for the most venomous snake bites in the USA. Copperhead Snake bites are, however, the last line of defence for this and many other venomous snakes. The common names for this group of snakes from the family: Viperidae are Copperhead snakes, chunk head snakes, death adder snakes, (dry-land) moccasin snakes, highland moccasin, narrow-banded copperhead, northern copperhead, pilot snake, poplar leaf snakes, red oak snakes, red snakes, southeastern copperhead, white oak snakes, American copperhead, southern copperhead and cantil cobrizo (Spanish). Adult Copperhead snakes have a coppery coloured head and neck. Copperhead snakes are medium sized snakes, with adults normally reaching 80 centimetres – 1.2 metres (2 – 4 feet), with thick, heavy bodies. Their body is more slender, however, compared to most other pit vipers. There are five clearly defined subspecies. All subspecies have distinctive light and dark brown or greenish banding. Northern copperhead, copperhead, highland moccasin, chunk head, death adder and (dry-land) moccasin have bands that tend to narrow dorsally, giving them an hourglass shape, whereas the others generally have bands of uniform width. Newborn Copperheads are coloured and patterned like adults, except the last inch of their tail which is a bright, yellow colour. Copperhead snakes can be found in most all habitats, although they often prefer to be near streams and other waterways. Copperhead snakes prefer habitats with lots of vines, vegetation and debris. Their colouration and patterning is very effective for camouflage in dead leaves on the forest floor. Copperhead snakes may be found on hilltops or lowlands. 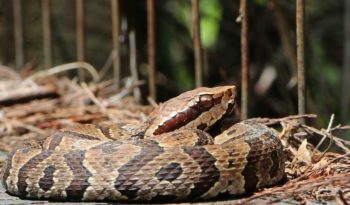 It is not unusual for Copperhead snakes to be found in forested or undeveloped areas within and near suburban developments. Copperhead snakes are often associated with rock outcroppings and ledges, however, they are also found in low-lying swampy regions. In the states, around the Gulf of Mexico, the Copperhead snake is also found in coniferous forest. In the Chihuahuan Desert of west Texas and northern Mexico, it occurs in water habitats, usually near permanent or semi permanent water and sometimes in dry arroyos (also called a wash or draw and is a dry creek bed or gulch that temporarily fills with water after a heavy rain). 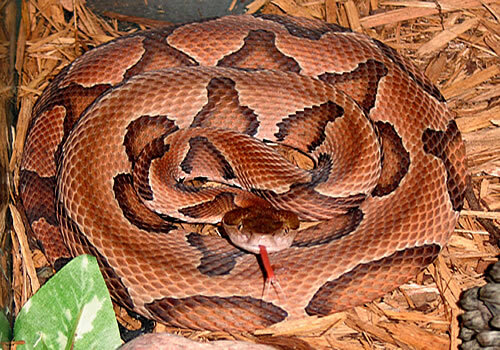 The Copperhead snake is one of the most successful of the larger snake species. Copperhead snakes rely upon camouflage and cover for safety when danger is perceived. It is usually not difficult to find a Copperhead snake crossing a road on a warm summer night. Because Copperhead snakes have a habit of freezing at the approach of danger, many are killed by vehicle traffic. When danger is perceived, Copperhead snakes will usually freeze in place and remain motionless for the threat to pass. This strategy works well in their natural habitat. Unless a person steps on them, grasps them or otherwise comes very, very close to them, Copperhead snakes will not usually bite. However, the bite will be readily used as a last defence. An agitated Copperhead snake will vibrate its tail rapidly. 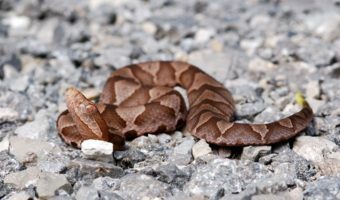 The relative abundance of Copperhead snakes and their occurrences near human habitations is the reason bites from Copperhead snakes are at the top of venomous snake bite statistics in the eastern US. 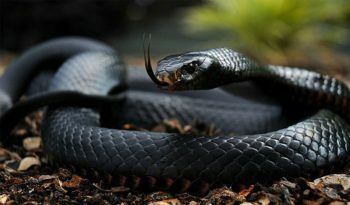 The Copperhead snake is venomous, however, their bite is almost never deadly to humans and they are generally non-aggressive. Copperhead snakes have an efficient venom delivery system, with long fangs mounted at the front of the jaw which swivel back to allow the snake to close its mouth. The Copperhead snake breeds in late summer, however, they do not breed every year. 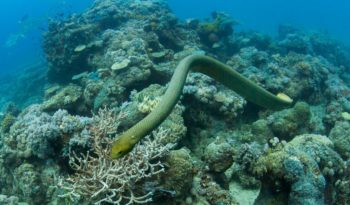 Sometimes a female will produce young for several years running and then will not breed at all for a long period of time. Female Copperhead snakes give birth to live young which measure around 20 centimetres long. A typical litter is 4 to 7, however, it can be as few as one or as many as 20. 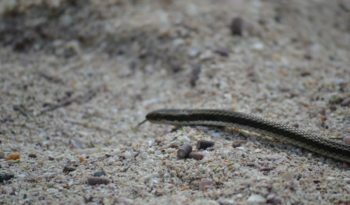 Apart from their size, the young are similar to the adults, however, they are lighter in colour and with a yellow-marked tip to the tail, which is used to lure lizards and frogs. The Copperhead snakes have an efficient venom delivery system, with long fangs mounted at the front of the jaw which swivel back to allow the snake to close its mouth. The primary role of the venom and fangs is to kill their food items quickly. The amount of venom a single Copperhead snake can deliver is insufficient to kill an otherwise healthy adult human. Copperhead snakes are capable of, however, producing intense pain, tingling, throbbing, swelling and severe nausea. 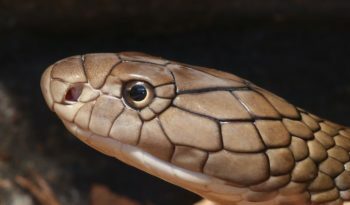 While rarely lethal, a Copperhead snake bite can be damaging to muscle and bone tissue, especially when the bite occurs in the outer extremities such as the hands and feet, areas in which there is not a large muscle mass to absorb the venom. 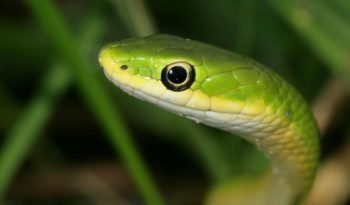 A bite from any venomous snake should be taken very seriously and immediate medical attention sought.